A high pressure system to the north of New Zealand is moving slowly away to the east. A low pressure system develops to the south of the South Island over the weekend. This combination brings moderate to strong wind over the country during the weekend. It looks like another weekend to be kite fishing on the east coast of both islands. On Saturday the North Island is forecast to have a strong southwesterly wind which will moderate during the day. The South Island should expect strong southwesterlies changing to strong northwesterlies as the day goes on. On Sunday the forecast is for northwesterlies over the entire country. The wind will be strong in the South Island. We set out in the second week of the school holidays with the children to our favourite holiday spot, Pukehina Beach. We had big dreams of catching lots of big fish. As you do. Armed with our Super Kite and Large Skyhook we set about our task earnestly. Spirits began to wane after about four sets when all we had was one gurnard for our efforts. We were using salted mullet for bait. After a talk with one of the friendly kite fishing locals we switched to using baby squid and salted bonito for bait. Our catches improved immediately and over the week and we caught some nice snapper (the largest being just under 5 pounds) and a few gurnard. 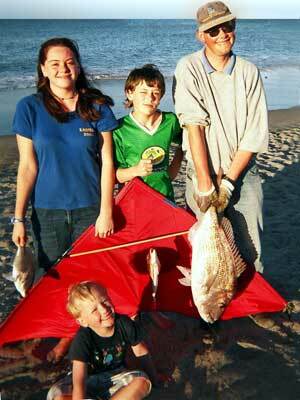 Noel Watson and family on Pukehina Beach with their 16 pound snapper. The winds stayed predominantly offshore all week and we were pretty satisfied with our catches. We decided to make the most of the weather and stay one extra day than what we had originally planned. The first set on Saturday wasn't the best in regard to angle etc. and we caught nothing. We pulled it down, reset things, and sent it off much better the second time. We could hardly believe our eyes when on retrieval we had a 16 pound snapper! This is by far the biggest fish we have caught so far using either the kite powered Bottom Longline or the kontiki and we were thrilled. At the same time we were bringing ours in our neighbour pulled in four snapper, all around the four to five pound mark. We have decided that it is back to Pukehina Beach at Labour Weekend for another go! Thanks for your website, we find it great. At some stage soon I plan to give Porangahau Beach a visit. First day's fishing with the excellent Flexiwing Kite. We stood in wonder as it almost went to the South Pole. The wind was from the northwest and blowing about 20 knots. We were using squid for bait and put out two sets, both with five hooks. The first set was put out to about 300 metres for half an hour. We retrieved the kite and caught no fish. Second set was out around 250 metres for half an hour. We recovered the kite and still no fish. Although we didn't catch any fish we were very happy with the way the Flexiwing Kite operated. We then went up to the Ferry Hotel for a drink and to get information on the best places to fish. We were advised by the locals to try Ocean Beach where a lot of Kontikis were used. As the mouth of the lake was closed, hence no whitebaiting, kitefishing would be possible. We couldn't wait for the next day. We were off to Ocean Beach on the 11/10/ 02. On the second day's fishing the Flexiwing Kite crashed on its first flight due to the lack of wind. We recovered the kite then tied a balloon on the top spar. We decided to wait about half an hour for wind to strengthen. We set the kite flying and let it out about 250 metres for 15 minutes, recovered the line and it came in with two kahawai. Reset the kite and let it go out 500 metres. The wind was blowing about 15 knots from the northwest by then. The kite nosed dived into the water when the wind died. We recovered the kite and line, it came in very easily with the balloon attached. We caught three kahawai, things were starting to look good. Set kite again and let it go out to 300 meters for 20 minutes, recovered the kite along with two kahawai and one gurnard. The wind was up to around 20 knots by this stage, the Flexiwing Kite went out pretty fast on the next set. Exciting stuff, then a qucik shift to dead calm once again and the kite nose dived into the water. It was an easy recovery due to the balloon attached to the kite. Best of all we had already hooked one kahawai. The wind quickly changed to the southwest so we packed up and headed for home. With one gurnard and eight kahawai in the bag we had a great days fishing. The latest report from the NZ Herald indicates the algae which are killing fish in the Hauraki Gulf have been identified. The algae are a species called Karenia mikimoto. A similar species was responsible for killing thousands of fish in Wellington Harbour in March 1998. The algae are only dangerous to fish when found in large concentrations. These are more common during the El Nino weather pattern. At least 10,000 fish have been washed up on Orewa Beach, Hatfields Beach and Red Beach since late last week. Most have been estuary and shallow water dwellers, such as flounder and eels. There is no indication that fish caught well off the beach are affected in anyway. Signs have been erected at the affected beaches warning members of the public not to collect fish or swim until further notice. Those eating the shellfish affected last time reported heat-sensitive skin, aching limbs and joints, and numb lips. There have been no reports of people being affected by the algae so far. People are urged to call the Enviroline on 0800-80-60-40 if they noticed anything out of the ordinary. We have had an interesting report sent in from the east coast of the South Island. I went fishing at Leithfield in March this year. I thought I would send in a report so everyone knows we go kite fishing in the South Island too. Using a Flexiwing Dropper Rig I put out two sets of three hooks and caught two sharks. The wind was blowing from the northwest on the day I went fishing and there was an incoming tide. The fishing gets better than this so I can't wait to go fishing again. I have had a Flexiwing Kite for four years now, and lived in Australia for the last three years. Every time I put my Flexiwing Dropper Rig out I always have a crowd gather around to see what I am doing. I have had some good hauls of fish from the beach. The locals throw the gurnard back when they catch them, not me! I took my Pocket Sled Rig to Thornton Beach two weeks ago. I put out four sets of hooks and caught one kahawai. Baiting my hooks with kahawai, I put out three hooks on each set. I thought with the moderate southwesterly wind blowing I would be in with a good chance of catching whatever was out there. The sea was calm so I moved on to Matata Beach and had a go at surfcasting. I changed my bait to salted bonito but I didn't manage to catch any fish there. Can't wait till the wind is offshore again so I can get out kite fishing. A couple of weeks ago I thought I would try Fitzroy Beach in northern Taranaki. The wind was blowing from the southeast so it was a good day to try out my rig. I put out one set and didn't catch anything. Roll on summer. Fishers in south Auckland will be pleased to know you have another local stockist of Paul's Fishing Kites products. GBK Fish Bait is now stocking our Target Snapper Hooks. Gareth and the team have set up a new shop and are open for business now. They will soon be stocking a comprehensive range of Paul's Fishing Kites Ready to Fish Rigs, Kites, Boat Longlines and spare parts. Drop in and see the team.